Offering high quality Amish handcrafted ornamentals! Give those outdoor birds a great home with an Amish crafted Bird House. Built with amazing detail these small structures look just like houses! Treat your outdoor birds with a beautiful bird feeder. Not only benefiting the birds but yourself too, by adding an Amish-crafted decoration to your outdoors! Decorate your home with any of our other ornamentals, from flower planters to arbors, built with the same detail as our small ornamentals. Click Here To See Poly Windmill Color Options! Patriotic Color Scheme also available (shown on right). 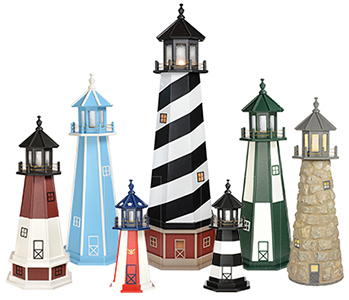 We offer lighthouses in wood, poly, and stone. Choose from a variety of styles and sizes! Click Here To See All Lighthouse Options! Available in a variety of sizes! Custom sizes also available. Find a location near you or get more info here.